Much of Arunachal Pradesh is forested with very little populationin remote areas of the state bordering China and Myanmar. The extreme north-eastern state is home to some of the country's unique scheduled tribes who trace their ethnicity to Tibeto-Burman stock and Tai/Singhpo/Tangsa clans of unknown origins. Out of a total population of just 14 lakh in the state, the tribal groups account for two-thirds and the rest are outsiders mostly from Bengal and Assam. It must be said here that culturally the tribes of Arunachal aremore associated with Southeast Asia that to the Indo-Aryan racesin the mainland. 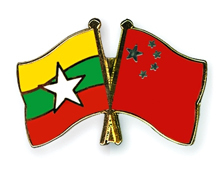 All the 26 major tribes and their sub-tribes are divided between the Tibeto-Burman areas bordering Burma and China on the one hand and Tai/Singpho/Tangsa areas bordering Bhutan to the west on the other hand. While Tani and Mishmi areas in the centre and the Naga areas tothe south, bordering both Burma and Nagaland have their ownlifestyle including languages, customs and beliefs. In between these areas there are transition zones, such as theBugun/Aka/Hruso/Miji/Sherdukpen area which form cultural "buffers" between the Tibetic Buddhist tribes and the animist Tani hill tribes close to Nagaland border. 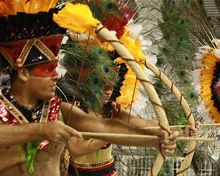 In addition, there are isolated sub-tribes and clans scattered throughout the state. Even within common cultural areas, we find tribes differentiated among each other through language and lifestyle as each of them speaks in mutually exclusive dialects. In the Tibetic area, Monpa tribes with several sub-tribes speaking closely related but mutually incomprehensible languages and also large numbers of Tibetans. Within the Tani area, major tribes include Nishi who also speak similar dialects like Bangni, Tagin and even Hills Miri. Apatani also live among the Nishi, but are distinct. In the central region of Arunachal, we find the predominance of Galo people with the major sub-groups of Lare and Pugo among others, extending to the Ramo and Pailibo areas (which are close in many ways to Galo). In the east, the Adis form a large group with many sub-tribes including Padam, Pasi, Minyong and Bokar, among others. Milang, while also falling within the general "Adi" sphere, are in many ways quite distinct. Moving east, the Idu, Miju and Digaru make up the "Mishmi" cultural-linguistic area, which may or may not form a coherent historical grouping. Tai Khamtis are similar to the Chakmas who have migrated from erstwhile East Pakistan. They follow the same Theraveda sect of Buddhism. The Chakmas consist of the majority of the tribal population in Diyun Circle. The districts of Lohit, Changlang and Papumpare have a considerable number of Chakmas. They speak a linguistic variant derived from Assamese and Bengali. Assam also has a large population of Chakmas who reside in the district of Karbi Anglong, Nagaon and Kachar. They also exhibit considerable convergence with the Singpho and Tangsa tribes of the same area, all of which are also found in Burma. 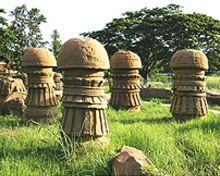 Finally, the Nocte and Wancho exhibit cultural affinities to the tribes of Nagaland which they border. In addition, there are large numbers of migrants from diverse areas of India and Bangladesh, who, while legally not entitled to settle permanently, in practice stay indefinitely, progressively altering the traditional demographic makeup of the state. A sizeable population of Nepalis -mostly Tibeto-Burman tribes who are yet to get tribal status in India -and Chakmas are distributed in different areas of the state. 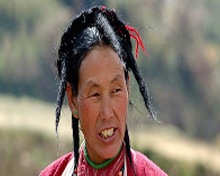 There are 26 major tribes and more than 100 sub-tribes in Arunachal Pradesh. The twelve tribes listed in the Scheduled Castes and Scheduled Tribes Lists (Modification) Order are: Abor (Galo), Aka, Apatani, Dafla (Nishi/Nishing/Bangni), Galong (identical with Abor), Khampti, Bugun (Khowa), Mishmi, Momba (Monpa), Naga tribes, Sherdukpen, Singhpo. While Hinduism is the largest religion in Arunachal, the local tribes follow variations of Buddhism and its spin-offs. According to some, the number of Hindus is growing as the animist traditions of tribes are merged with folk Hinduism. A relatively large percentage of Arunachal's population is animist and follow tribal traditions which are described as Donyi-Polo in the Tani area and Rangfrah in the east. Tibetan Buddhism is practised in Tawang and West Kameng districts, besides in isolated parts bordering Tibet. 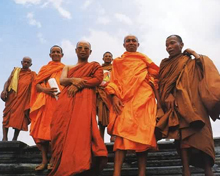 Theravada Buddhism is followed by groups living near the Burmese border. Around 19% of the population are said to be followers of the Christian faith, and this percentage is growing due to Christian missionary activities in that area. The practice of animism and major religions like Hinduism and Christianity are prevalent among all 26 major tribes and their more than 100 sub-tribes in Arunachal Pradesh. Out of the 101 recognised tribes, 37 are having an animist majority (Nissi, Adi Gallong, Tagin, Adi Minyong, Adi, Apatani, Bugun, etc); 23 are having a Christian majority (Wancho, Dafla, Mossang Tangsa, Bori, Yobin,etc); 15 are having a Hindu majority (Mishmi, Mishing/Miri, Deori, Aka, Longchang Tangsa,etc); and 17 are having a Buddhist majority (Monpa, Khampti, Tawang Monpa, Momba, Singpho, Sherdukpen, etc). The remaining 8 tribes are multi-faith and does not have a dominant religion (Nocte, Tangsa, Naga, etc). A law has been enacted in the Arunachal legislative assembly to protect the iindigenous religions in the state against the spread of other religions.